The Details: I love the first 11 episodes, the second season, the OAVs, and I at least like the movie a lot. Unfortunately not much more of Rurouni Kenshin is pertinent to the storyline. A lot of season 1 is filler, and after the second season builds up the story arc to a climax the 3rd season suddenly veers away from it and back into filler territory. The first set of OAVs try to make up for this by covering the Remembrances chapters of the manga, when the Enishi threat became apparent and Kenshin needed to explain his past (the married part of it) to the gang. I have only seen Seisouhen OAV #1 so far, but it seems to be continuing the real story. Alluding to Kenshin going through this Remembrances retelling, and bringing in Enishi -- a silly guy (I love him, heh) who carts around hot air balloons and freaks. Not that I have seen his balloon or freaks animated yet. I hope the balloon line is included! The look of the characters was difficult to adjust to in Seisouhen, but as long as it truly covers the Enishi story-line it'll be worth it to finally see the end of the plot they were building in season 2. Even early in the first season I cared a great deal about Kenshin's whole "happy" gang. They have interesting backgrounds, and their own personal tragedies. Let's face it, though, I need enjoyable antagonists to be happy. Barring the occasional filler bad guys who come and go quickly, they're mostly prominent early in the first season, one of the most easy to appreciate aspects of Kenshin is that the characters tend to be justified rather than plain ol' villains. With the numerous hostilities, and the varied sides, developed during the Bakumatsu, and afterward when Samurai lost their status during the Meiji era, there are reasons for anyone to be an antagonist. Even the lead characters. The first characters who made me fully appreciate the story were Hannya, Aoshi, and the rest of the Oniwa Banshu from the early season 1 arc. They were antagonists. but entirely sympathetic... and sad in the end. I love the entire Shishio and Juppon Gatana arc, so it is natural to assume I love the characters as well. I wouldn't say I love every single one of them, but there are some definte charmers amongst Shishio's groupies. And anti-charmers, like Usui. We all know I'm a sucker for jerks, though, so who did I pick as my favourite character when season 2 fully sucked me in? Saitou Hajime! Too kakkoii, heh. And, yes, I did cut suddenly to mentioning him because I realized how long I have been sitting here rambling. It's moot anyway, since the cels are too pricey for me to get into seriously collecting them. It could be that my teensy collection stems from my not having seen this series in a couple of years or more. I haven't even looked at the manga in a long time! If I rewatch it, the need to collect might overrule the need to spare some money. Up next: Hrm. Probably the happy gang in a group cel. Comments: Shinsen Gumi attacks Kenshin's imperialist faction at night, hoping to find the demon (Kenshin) who has been cruelly killing their numbers. After a few skirmishes, they know they still haven't found the Battousai. As Kenshin and Tomoe sneak by a Shinsen Gumi mob, Saitou (amidst the crowd) comments here that he thought he smelled the out of season blossoming of a plum tree (Tomoe uses plum scent). This was another dream cel knocked off my list. 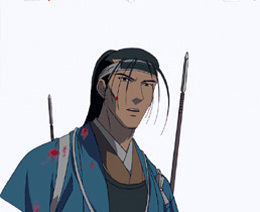 I'd badly wanted a young Saitou, but a bloody one is better yet. For that matter, I love his 22(?) year old character design in the OAVs (*positively drooling*) and hadn't been expecting to find one of those cels since Saitou has so precious few OAV moments. Episode #: 49: The Wolf Catches the Shin Gun. Explosive Zero Gatotsu! Comments: An absolutely wonderful Saitou cel! 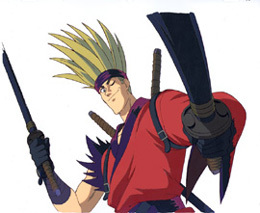 After spending all of my cel collecting days whining pathetically about never being able to get a Saitou cel, I finally (with much shrieking and swooning) have one. *very happy* After condescendingly insulting Usui's little Shin Gun trick, Saitou very accurately details the truth behind Usui hanging out with Shishio to let him know it's obvious how pathetic he is. Usui laughs, Saitou (here) laughs with him, and there ensues an interesting moment of two scary bastards (only one of which is loveable) laughing evilly together before Usui finally snaps and demands to know what the hell Saitou knows (a lot, Usui, really). I adore the way Saitou never misses a beat on insulting Usui all the way through this episode. Comments: Shishio from the season 2 opening. Beautiful cel, but the background refused to cooperate with scanning. I tried and tried to fix it, to no avail. I'll try one more experiment within the next couple of days, but if that fails I'll need to give up and go with this lousy option. As Shishio was one of the few reasons I liked RK, I needed a cel of him but I also needed one that struck me as just right. I love the colours, being a dark bright red/ black/ burgundy kind of person (so this is more orange, but as I'm also a fire fetishist it still works perfectly for me). 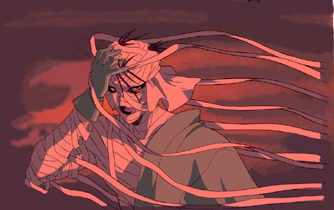 And I love the unravelling/ blowing bandages. An Anji OP cel will join this one shortly (hopefully). Comments: Aoshi! So pretty they even needed to title an episode in honour of it. 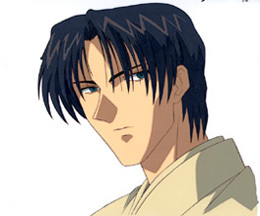 Aoshi is the goth of the Rurouni Kenshin world (sorry, but he does strike me that way). He has a lot of guilt to deal with, stemming from his failure at Edo castle. And then from his failure (though they risked themselves for him) in protecting members of his Oniwa Banshu. He's never a bad guy, but he does get it into his frazzled mind that killing Kenshin would solve his problems and honour his lost Oniwa Banshu. 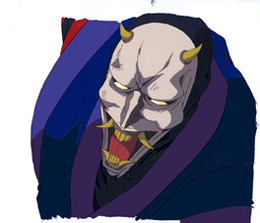 Comments: Since Hannya was the first antagonist to fully win me over (great character design, he seemed to have a good attitude as well, and I got to know him slightly sooner than his cherished Aoshi), I was thrilled to find a cel of him. Hannya, obviously, has his demon mask, he seems to blow steam out his ears (not really, but they never do say how he does it), has arms that appear to stretch, and he has a tendency of hanging upside down outside of windows then disappearing suddenly. He seemed quite interesting, all in all, and I was deeply bummed that he wasn't around longer. Comments: Cho, aka Broomhead, showing off his multiple sword use techniques. He'd just demonstrated for the son of swordsmith Shakku Arai and his family that he could throw their baby up off a katana along with the hilt and then resettle both of them back onto the blade. When they refused to let him see the last sword made by Shakku Arai, he said he was so upset that he might slip up when repeating the same trick a second time (ie he would impale the baby). At the beginning of this sequence he's saying he rarely does the same trick twice for anyone, it would be quite a treat so they should sit back and watch. He begins moving to demonstrate in this cel. Cho is the silliest member of Shishio's Juppon Gatana, a major contender for Sano's position as Saitou's toy (sorry, can't help myself), and a future (oft-forgotten) assistant of Saitou. I like him, despite his unfavourable debut of scaring a baby. Comments: Possible Spoiler. Young Kenshin, in the first set of OAVs. 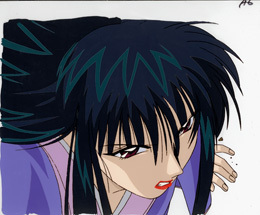 On his way to find Tomoe, confused about her betrayal, Kenshin is ambushed by a series of ninja assassins. The first attacker initially draws a sword, but it is only used for distraction as he then shoots a dart from something worn under his wrist. 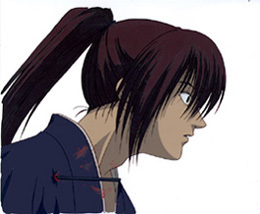 Because of his bad frame of mind Kenshin was caught off guard and hit by the dart. The colour turned out a bit splotchy in this scan. 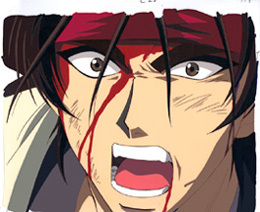 Comments: Sanosuke, aka Sano, aka Zanza, in a great bloody close-up. My first best guess was close to right, the scene does involve Saitou around the time of the Shishio fight. 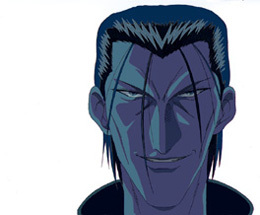 This cel, as I like to say, is a fine representation of Sano being all fangirly about him. ;) SPOILER! After the fight with Shishio (who did the damage exhibited here) has ended and the place is blowing up, Saitou tells Sano to get Kenshin out of there. A chunk of the bridge they're on explodes... and Saitou is on the opposite side. Sano is first very happy to see him alive, and then very upset that he pretty much just says "yare, yare", lights a cigarette, lets Sano know he gave Aoshi the map to lead him out of there, and turns around to walk back to the collapsing inferno. Sano's freaking out every which and way, and at this exact moment yells "What about our fight?" (like he's any match for Saitou... Maybe what he actually meant was "But what about that whipping you were going to give me?!"). Comments: A very fierce-looking (but still beautiful) Megumi. Something is shattering near her left hand. I'll need to look over her escape arc sometime to see if I can spot this moment.